"The kind of music I was interested in was the kind you found in someone's kitchen. Somebody just playing alone, solo violin or fiddle or accordion. That was the idea of BeauSoleil"
With a career spanning nearly thirty years, Grammy winners BeauSoleil have remained remarkably on track with their approach, which is entrenched firmly in Cajun roots music. By blending zydeco, Tex-Mex, blues, country and even a smattering of traditional New Orleans jazz, the band has steered clear of trying to mainstream their sound, and when founder/lead vocalist Michael Doucet sings he does so in a non-English blend of Arcadian, Cajun and French. It all seems like pretty authentic stuff (even the tunes they wrote), and BeauSoleil plays the whole thing straight, without any noticeable modern touches, relying heavily on fiddles, banjos, accordions and mandolins to drive their sound. Recorded in 2002 at the sprawling and historical New Orleans Jazz & Heritage Festival, this twelve song set, performed in broad daylight, drips with rich Cajun accents, even as the six-piece band works to span the huge spatial gap between the wide outdoor stage and the crowd. 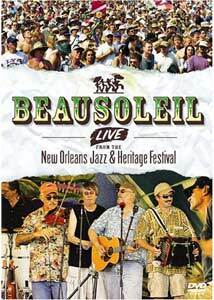 I know The New Orleans Jazz & Heritage Festival has been going on for 35 years, but the big crowds and festival setting here seems too broad and impersonal to properly channel the foot-stomping music of BeauSoleil, but that's where the DVD narrows that distance somewhat. While the band may not be the most energetic set of performers (it's almost like they drew small circles on the stage and were told not step out of them), the direction of Michael Murphy keeps the cameras in movement, highlighting Doucet's fiddle playing, the standup bass work of Al Tharp or the accordion stretching of Jimmy Breaux, in between shots of the seemingly appreciative crowds. If you're new to this genre of music, there may be an immediate sense of "hey, all these songs sound the same", what with all the recurrent toe-tapping fiddling and accordion licks sprinkled throughout—to say nothing of the non-English lyrics—but the subtle sameness is in large part a reflection of the roots of the Cajun music itself; much like blues or traditional country, song structures for this type of culturally unique music are quite similar. This live set, while maybe not the most riveting to look at, delivers a dose of close quarters party music, even if it's in a festival setting. Image Transfer Review: Presented in 1.33:1 fullframe, this daylight outdoor concert disc doesn't have the usual problems of indoor smeary stage lights to contend with, so the result is a pleasantly crisp image with warm, natural colors. Detail is strong, and closeups of the musicians reveal accurate fleshtones. Audio Transfer Review: Audio is available in either Dolby Digital 5.1 Surround or 2.0 stereo. Being a concert disc it should be no surprise that the 5.1 mix is the preferred choice here, and there is a surprisingly amount of deep, clean bass, more so than I would have expected. Audience cues get dumped into the rear channels, and the separation across the front speakers creates a full soundstage that gets substantially compressed in the stereo mix. Extras Review: Extras are fairly plentiful, and include three additional BeauSoleil performances, one performed live in a park setting (Verise), with the other two being music videos (Bunk's Blues, Sophie). There are also separate interview segments with all of the band members citing their backgrounds, all of which use a distracting series of quick fade outs between sound bites, and leader Michael Doucet also spouts some kind words about fiddle legends Dennis McGee and Canray Fontenot. The disc is cut into 12 chapters. The wide-open setting of The New Orleans Jazz & Heritage Festival kind of dilutes the punch of BeauSoleil—they're really best appreciated in a small, crowded club—but they still manage to bring the bayou to life in this set. Bowl up some crawfish and pour yourself a Hurricane.